Madisien Steele is a Trauma Informed Practitioner at Fall-Hamilton Enhanced Option Elementary School in Nashville, Tennessee. Growing up in a foster family, Madisien closely witnessed the effects that trauma, neglect, and substance abuse has on a developing child. As a foster sister, she experienced this in a more personal way and truly understood the lifelong effect that these traumatic experiences can have on children. She ended up pursuing a degree in psychology and went on to complete her Masters in professional counseling with a focus on clinical mental health counseling. She began her career working in community mental health supporting children and young adults with developmental and mental health needs before transitioning into a role as a crisis counselor. While working on her masters, she began to learn more about trauma-informed practices and decided to switch to education in order to have a more reaching impact. We had a chance to talk with Madisien to discuss the power of trauma-informed practices and how Fall-Hamilton is strengthening the social and emotional wellbeing of all staff and students. MTW: Can you tell me more about your role as a Trauma Informed Practitioner at Fall Hamilton Elementary School? MS: Within my role I meet both individually with students and with small groups. One of our main trauma-informed programs is called, “Bounce Back,” which we started last February. The purpose of the program is to foster resilience in students who have experienced an ACE (Adverse Childhood Experience) or some type of trauma. During our sessions we focus on building coping skills, learning to self regulate, and practicing emotional expression. We also practice tools and strategies that students can use when the stress response is activated due to the effects of ongoing toxic stress, of if a new experience is to, unfortunately, occur. The primary goal of these groups is to show students that these experience do not need to determine their future. Outside of “Bounce Back” I work with the crisis response team and meet with teachers regularly. If students are having difficulty in the classroom I go in to assist with de-escalation and help the student re-regulate so they can reintegrate with the class. I also consult with teachers often to discuss student progress and provide them with helpful strategies to use in the classroom. MTW: We’ve been hearing a lot about trauma-informed programs and schools. Can you explain what exactly “trauma-informed” means? MS: Trauma-informed means that you have an ongoing dedication to increasing your knowledge and awareness of trauma and the impact that it has on students and families. Fall-Hamilton is the pilot school for the Metro Nashville Public School trauma informed program and our staff is receiving ongoing professional development focusing on adverse childhood experience. Becoming trauma-informed requires you to switch your perspective. I like to think of it as a spotlight. When you’re watching show, the spotlight is on the performer and you can’t see what’s going on in the background. Trauma-informed practices help us expand that spotlight to a floodlight. We’re no longer just going to look at what’s wrong with the child but we’re going to see what else is happening in the background. We’re going to look at the child’s home situation, family life, etc. so we have a better understanding of what’s going on. MTW: What are some steps teachers can take to make a classroom environment that is trauma-sensitive? Once you take on this perspective, I think you see an immediate shift in the relationships in the classroom. It’s important to use every opportunity to teach these social emotional learning skills. As adults, we should be openly modeling these skills to our students in an honest way. It’s okay to show that you’re stressed or frustrated, but then model how you’re going to self-regulate and manage these feelings. Two easy changes teachers can make within the classroom include establishing peace corners and creating a low stress classroom environment. Peace corners give students a safe place to de-escalate from difficult situations. In order to create a low stress classroom, teachers should be mindful of their tone and body language. Overall, simply having the awareness that trauma exits is helpful. You never know exactly what a child is going through outside of your classroom walls, so we should always be operating as if a child may have experienced a trauma. MTW: That’s such great advice for our teachers. It seems like this work could really affect and weigh heavily on them at times. How does the administration at Fall Hamilton support teacher’s social emotional learning and wellbeing? MS: We have really been emphasizing self care this year. We meet monthly for professional development that revolves around staff support and self care. We want to make sure we are bringing kids into a calm environment, but in order to do that, we need to create that calm for ourselves. As part of this initiative, we’re participating in Happy Teacher Revolution. This year, each staff member was also assigned an accountability partner. During our monthly meetings, partners check in with one another and discuss some things they’ve been doing to take care of themselves. We’ll take some time to meet in groups and check in with one another, share things we’re grateful for, etc. A newsletter is distributed each Tuesday, which includes a self care section. We’re very lucky to have some amazing teachers who facilitate faculty yoga and mindfulness sessions. We also offer “Tap Outs for Teachers.” This program encourages teachers to contact a member of the crisis response team if they’re feeling overwhelmed and need a moment for themselves. Vicarious trauma takes a toll on teachers, so it’s important for them to have a safe space, too. MTW: It’s clear that you emphasize the importance of wellbeing for both your students and your staff. What are some specific student-facing programs that students are engaged in this year? MS: One of the things we emphasize is student leadership through the Leader In Me program. Students learn and develop leadership skills and then utilize them throughout the day, particularly during clubs. Clubs meet every Friday from 2 to 3:30 and it’s so great to hear the kids using the language they’ve learned from the program. Earlier, I mentioned that peace corners are an easy way to start creating a trauma-sensitive classroom. Every single room in Fall Hamilton includes a “Peaceful Place,” including the cafeteria, office, etc. We also have a “Peace Path” outside which walks students through the steps of conflict resolution and “Peace Keepers” which is a group of students who have been trained in conflict resolution strategies and can assist other students. We also open and close our day with Move This World. 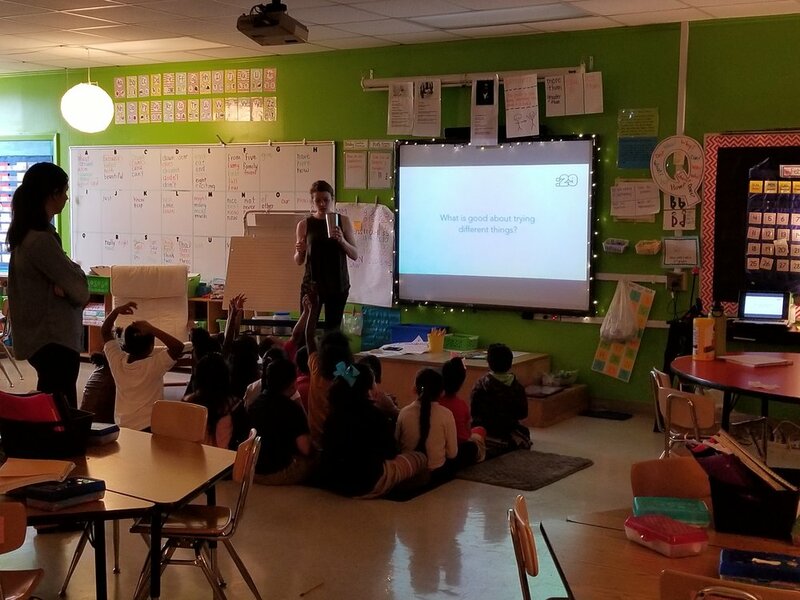 This social emotional learning program has helped us create a common language across the school and has taught students emotional management skills. I love to share one story about one of our fourth grade students. This particular student had a significant trauma history and chronic behavior issues. One day they were having a difficult time in music class and the teacher called the crisis team. By the time I got there, they had already put Move This World’s “emogers” (emotional management) strategies to work. They told me, “I can’t talk right now. I need to get a drink of water.” After they got their drink they said, “I need to count.” Finally, they put their on the wall and said, “I’m going to take some deep breaths.” They continued to go through strategies until they were ready to go back to class. It was amazing to see them recognize what they needed in a particular the moment and regulate themselves. Since starting Move This World I hear students encouraging one another and taking a more proactive stance to helping one another. I see a difference in the faculty as well. They’re putting these strategies to use for themselves, which is a powerful model for students. We’re all human and we experience these thing, too. MTW: That’s such an amazing story. Thank you for sharing! Before we wrap up the interview, what is your best piece of advice? MS: To be human. So often in our professional roles we feel we have to be perfect and can’t make mistakes. Mistakes happen and they are apart of life. Once we accept that, our stress levels will go down. Our anxiety about performance goes down. We’re all people, we need to acknowledge we have flaws and recognize that that’s ok.